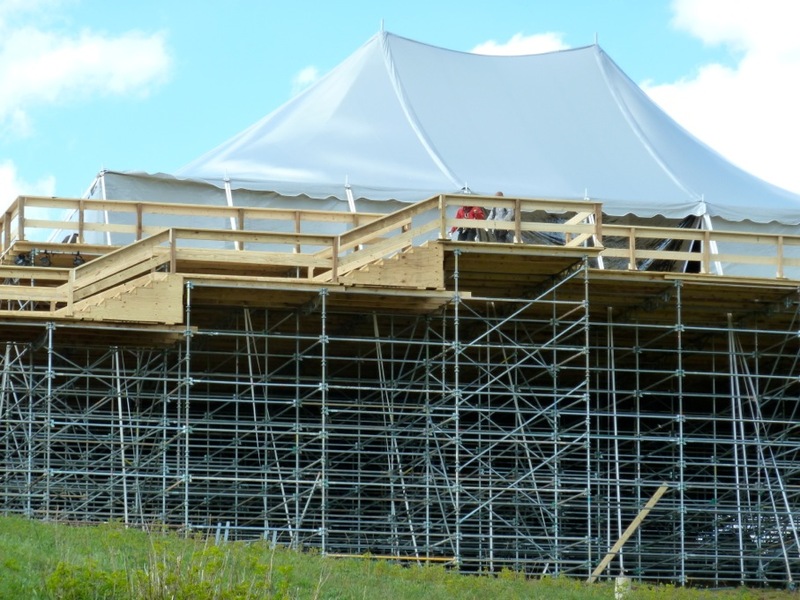 It took a significant amount of scaffolding to create a solid platform for the main tent at the Little Annie wedding site. The frame of an out door chapel, and a tent that served as the main dining and dancing hall, stand at the top of Little Annie Basin on June 16, two days after a private wedding took place. ASPEN – The Pitkin County Commissioners approved an emergency ordinance at a special meeting Wednesday that put into place a nine-month moratorium in the county’s “rural and remote zone” on party tents and other temporary structures larger than 1,000 square feet — with a few exceptions. The exceptions to the moratorium are for party tents of up to 1,000 square feet, tents approved as part of either a special-event permit or a temporary commercial-use permit, or tents approved by the county commissioners after a formal appeal to the board. 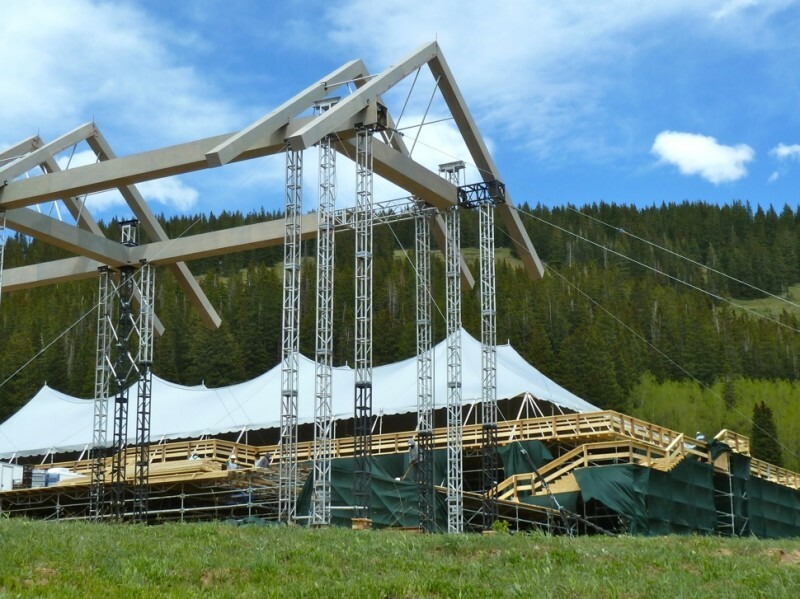 The moratorium is in response to the 27,000 square feet of tents and structures erected for a wedding on June 14 in a meadow on private property at the top of Little Annie Basin, which is on the backside of Aspen Mountain and in the rural and remote zone. Since the event was on private property, and the owner, John Miller, said there would be no charge for the wedding of his friend’s daughter, the county was unable to review and regulate the event and the structures, as it could have if it was a commercial transaction or a special event open to the public. Commercial and special-event permits typically include plans for construction management, traffic control and community relations — all things that some residents of lower Little Annie Road said were solely lacking for the event. Crews began working on the site on June 5 and have until June 21 to take down the structures and restore the high-mountain meadow, parts of which have been worn down to bare dirt. The state of the high country meadow in Little Annie Basin on Monday, June 16, 2014, two days after a wedding. 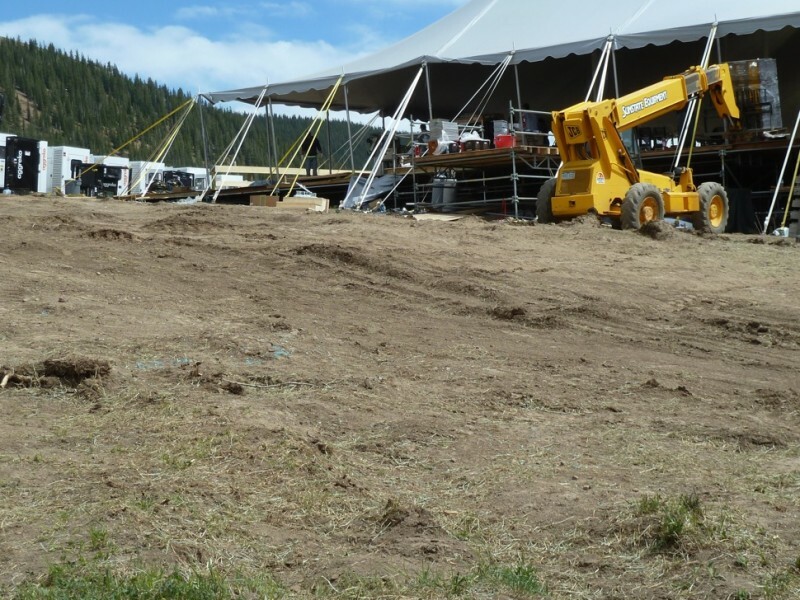 The area shown is behind the main tent, and shows the ill effects of nine days of steady truck and construction-machine traffic. The moratorium approved for the rural and remote zone was meant to close the loophole in the county code that allowed for large temporary structures on private land, for private events, with no additional regulation or mitigation. The three commissioners present at Wednesday’s special meeting — Rob Ittner, George Newman and Rachel Richards — voted to approve the moratorium. Commissioners Steve Child and Michael Owsley were not present. The moratorium took effect immediately after the votes were cast at midday on Wednesday. There is a public hearing set for July 9 in front of the commissioners on the issue. The moratorium only applies to property within the rural and remote zone, which also restricts house sizes to 1,000 square feet. Large party tents on private property outside of the rural and remote zone will still only require a building permit from the county to erect, and won’t get the kind of scrutiny given to events in the review of special-event permits and temporary-commercial-use permits. And while the commissions exempted tents of up to 1,000 square feet, they also put some limitations on that exemption. For example, if no house is on the property, then a 1,000-square-foot tent is allowed. But if, for example, a 1,000-square-foot house is on a property, the commissioners decided that half of that existing square footage would be exempt, and the other half could be used for a temporary tent. Given that, the owner of a 1,000-square-foot house could put up a 500-square-foot tent with just a building permit. Another way to get a larger tent approved is if it is part of a successful application for either a special-event permit or a temporary-commercial-use permit. And a third option for property owners is to appeal directly to the commissioners for an exemption. That’s what John Wilcox, owner of the Pine Creek Cookhouse, did Wednesday. Wilcox owns a 5,227-square-foot house just above the cookhouse on property that was zoned rural and remote after the house was built in 1994. Under the moratorium, even half of his house would still equal 2,613 square feet, well above the 1,000-foot rural and remote size limit for structures. So Wilcox asked the commissioners to exempt a 2,500-square-foot tent to be set up for a June 28 wedding he was hosting at his house as a non-commercial event. The commissioners agreed and cited the Wilcox exemption in the emergency ordinance. Editor’s note: Aspen Journalism collaborated on this story with the Aspen Daily News, which published the story on Thursday, June 19, 2014.